Are you seeking in-depth information about the operation of valve amplifiers? Then this double-layer DVD is for you. 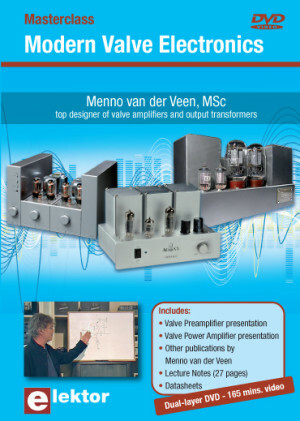 This high-quality DVD contains 165 minutes of masterclass and much more presented by Menno van der Veen, a globally recognized valve amplifier design specialist. Topics discussed include valve load line graphs, current sources, and current fold-back techniques. The DVD also covers the negative effect of cathode electrolytics and how to reduce supply-voltage interference. With the help of state-of-the-art measurement techniques, Menno proves the (in)correctness of feedback and he shows the inner workings of the core of the output transformer in detail. Take advantage of a special introductory offer. Order before June 25, 2012 and get an $8 discount off the normal sales price of this DVD! You pay just $34.20 instead of $40.20.